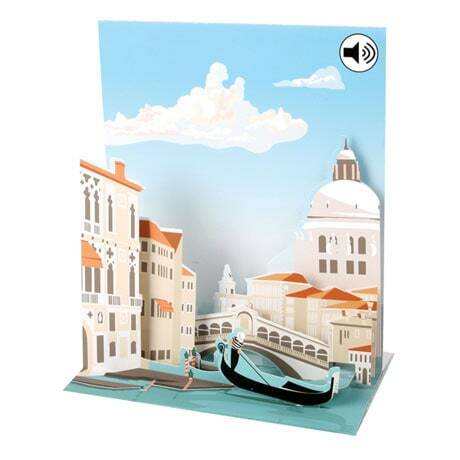 Few experiences match the magic of floating down the canals of Venice on a gondola, and with our lovely Venice Musical Pop-Up Card, you can gift that feeling to friends and family anytime! This charming 5"x7½" card features an enchanting 3D cityscape of La Serenissima, with a gondolier guiding his elegant craft through crystal blue waters as the soaring duomo rises in the background. With the push of a button, the card plays cheerful Italian music, adding the finishing touch to the scene! With four stickers with messages to personalize the card ("Happy Birthday!," "I love you!," "Best Wishes," and blank), and plenty of room on the back for an extra note, it makes the perfect all-occasion greeting. Includes matching envelope; extra postage required.